Delighted that we were chosen as a Burning Man Honoraria recipient with our 15 foot wide bald eagle made of pennies, nickels and dimes. It was visited by thousands in the big, pop up gallery known as Black Rock City or Burning Man. Many thanks to our art team for helping to create this striking installation. Grateful as well to community friends who contributed their loose change that became the feathers of this bird of prey. Let U.S. Prey. A Metaphor on the Attack. This is the Story. We are honored to have our Burning Man 2017 project Ursa Mater installed in Tahoe City, CA. Special thanks to Tahoe Public Art and generous local Burners who have made this year long show possible. We and locals agree that Ursa Mater is a good fit for the Tahoe Region as they are taking on more public art. This event comes right after Ursa Mater was shown in downtown San Jose for three months courtesy of that city's Playa to Paseo Project. See how Ursa Mater has become a friend of the Lake Tahoe Community. Our Burning Man honoraria project Ursa Major was chosen to be part of the Renwick Gallery/Smithsonian American Art Museum Burning Man exhibition in Washington, DC. A collaboration with the Golden Triangle Business improvement District. The exposition is called: No Spectators: The Art of Burning Man. The showing was from March to December of 2018 where thousands of people got to experience Ursa Major in an urban setting. Now that Ursa Mater has found a home, here is a look at her journey from Burning Man to San Jose and now Lake Tahoe. We hope you enjoy this, plus the supporting narrative about a mother’s love by Kerrie Penney. 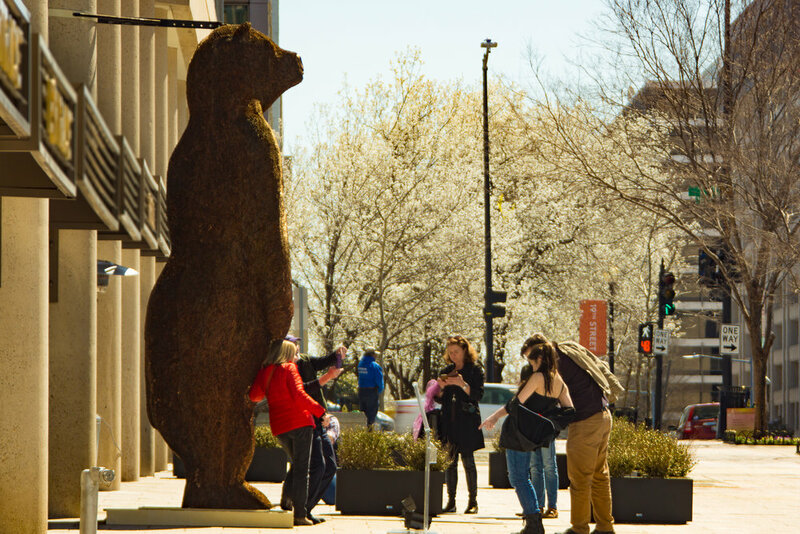 Our Penny Bear film has been updated and extended since Ursa Major has been moved from her home in Santa Fe to the Smithsonian Exhibition in Washington, D.C. for 2018. This is a fun little video and it is narrated by our 8 year old niece Olive.